The Swedish word for business is närings – liv. It means nourishment for life or nurturing life. In English the word business means “to be busy” - “a state of being much occupied or engaged”, or “what one is about at the moment,” (comes from bisignes in Old English 1). Many of the challenges and problems we face today are generally related to how we satisfy our basic and essential needs without destroying the psychological sense of community: the sense that there is a network of and structure to relationships that strengthens rather than dilutes feelings of belonging (Sarason ’74). The earth and everything in nature are part of the community in which we need to have feelings of belonging. When the individual is considered the single most important entity of our species the idea of business as nourishing life becomes segregated into isolated service delivery silos by specialty, problem, and solutions. Programs spring from disconnected service providers who are oriented within their own narrow specialty to focus on the individual. A powerful and pervasive service delivery industrial complex, driven by commerce and survival of the fittest (agency) considers everything in the environment as a resource for unbridled use in their service to satisfy human needs. 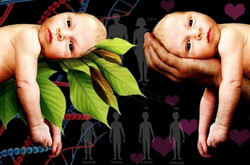 All of this has mediated our biological inclination to be in authentic natural relationships that nourish life. No one has articulated this better than John McKnight in his classic work: The Careless Society: Community and its Counterfeits, (McKnight 1995). McKnight tells the story of “John Deere and the Bereavement Counselor” where the invention of the tractor, the “sodbusting tool,” and a new “grief technology,” altered both the relationship of people with their land and to each other. The profession of “bereavement counseling” was born and a “new service technology” was established based on a belief that one’s family and neighbors did not know how to help someone deal with the grief over the loss of a loved one. The “new service technology” believes that the individual is the most important single entity of our species. One individual has unique specialized and sanctioned information and skills (technology) that have been affirmed (diploma – credentials) by those in power to be preferable to past practices. It disempowers a majority of the population and places little value on the historical practices of people helping people and that a neighborhood and community had all the skills and resources necessary to nourish life. Rugged individualism and survival of the fittest permeates our consciousness and manifests itself into all of our systems and organizations. Agencies within large systems, like education, health care, youth and human services, etc. see themselves as independent organisms - single entities within the larger web of life in a “service delivery universe.” Each entity is immersed in commerce as the central focus for their survival. Given limited funding and resources to maintain each independent organism, agencies are unwittingly pitted against each other and only the strongest survive. Silo service delivery is not sustainable. There is no economic or practical way we can provide a service to everyone for everything. Services do not provide nourishment for life. People in meaningful, authentic relationships do. How can we move towards more egalitarian beliefs and behaviors that contribute to the good of the whole, nourish life and act as if we are all related? In the epilogue of Small is Beautiful: Economics as if People Mattered, E. F. Schumacher, (1973) writes: “Everywhere people ask: "What can I actually do?" The answer is as simple as it is disconcerting: we can, each of us, work to put our own inner house in order. The guidance we need for this work cannot be found in science or technology, the value of which utterly depends on the ends they serve; but it can still be found in the traditional wisdom of mankind” (p.281). And, this “traditional wisdom of mankind” includes initiation and rites of passage. It was the way we helped our children go from a consciousness of ME to one of WE. 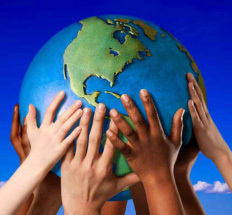 It was the way children came to remember their connection to that which is greater than thee and to come into balance with all their relations, everyone and everything on the planet and the earth itself. Youth and community development through rites of passage is an organizing framework. It is a lens through which we can see unlimited possibilities to alter the conditions that impact youth development and our psychological sense of community. It views all things as related where the individual is in a reciprocal relationship with their community, which includes the earth and everything within nature. The community is the single most important entity of our species, but relies on each individual’s feelings of belonging to it. These feelings of belonging must be firmly anchored in the consciousness of each individual, which is accomplished through community-oriented rites of passage. 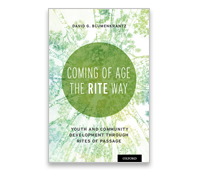 When rites of passage emerge in a community they can lay a strong foundation for promoting health and can be the common language which galvanizes actions for subsequent community caring when youth development doesn’t go as planned, which is frequently the case (Gavazzi & Blumenkrantz, 1993). It intentionally offers integrated design opportunities across the traditional spectrum of service delivery from prevention and health promotion to identification, intervention, and treatment of symptoms or problems and pathways for effective follow-up and aftercare. Most important it integrates service delivery within a culture of citizens, youth and adults who expect to be partners with professionals in a caring community that provides nourishment for life. Through rites of passage, children and adults become responsible for their own lives and are willing and capable to help their neighbors and fellow citizens satisfy their basic and essential needs while contributing to feelings of belonging and connection with all of their relations. 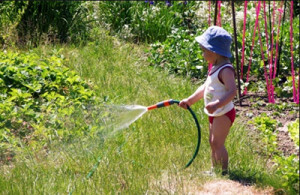 Natural relationships, with others and with our environment, can provide authentic nourishment for life. Professional service delivery has usurped these natural relationships which occur everywhere, and which can be brought to bear on the challenges of living in a complex world. There is no greater challenge than raising our children and grappling with the problems of living in a complex world. McKnight, John. The Careless Society: Community and Its Counterfeits. Basic books publishers. New York. 1995. Sarason, Seymour. The psychological sense of community: Prospects for a community psychology. San Francisco: Jossey-Bass, 1974. Schumacher, E. F. Small is Beautiful: Economics as if People Mattered. Harper & Row, Publishers, New York. 1973. The above is excerpted: “And, How Are the Children? Rites of Passage and the Future of All My Relations,” (2014). Originally published in 1996 it details the relationship between initiation/rites of passage and the psychological sense of community. 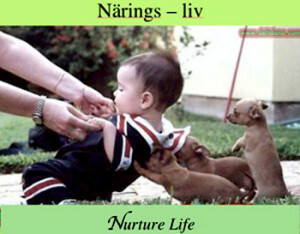 Thanks to my friend & Tocayo David Isaacs for introducing me to närings – liv and offering input. Thanks to Mark Goldstein & Louann Virgil for editing, insights and encouragement, John McKnight, Jody Kretzmann, Bob Francis, Michelle Obama, and all those connected to the Assets Based Community Development Institute, and to the ancestors for planting the seeds long ago. Join the conversation by emailing your thoughts, comments or questions to thecenter@rope.org – or join the conversation on the ROPE® Facebook page. © David Blumenkrantz, 2014. No permission is granted to copy, extract language or design principles, without appropriate reference and citation.